For Gilbride's son, who is currently the tight ends coach for the New York Giants, see Kevin M. Gilbride. Kevin Bernard Gilbride (born August 27, 1951) is an American former football coach. He served as a coach or coordinator for various NFL teams for over twenty years, and is a longtime friend of Tom Coughlin since his days in Jacksonville. He spent seven years as the offensive coordinator for the New York Giants, with whom he earned two Super Bowl rings. Gilbride attended Southern Connecticut State University, where he played both quarterback and tight end and earned a degree in Physical Education. He then went to Idaho State University, where he earned a Masters' degree in athletic administration. From 1989-2014, Gilbride served as an assistant with a number of NFL franchises, working as quarterbacks coach and offensive coordinator. For their inaugural season in 1995, the Jaguars hired Tom Coughlin as head coach and Gilbride as offensive coordinator. The team finished 4-12 scoring just 275 point, 27th in the league. The following year, the team went 9-7 scoring 325 points, fourteenth in the league, but second in yards. The Jaguars defeated the Buffalo Bills in the AFC Wild Card Game 30-27, and then the Denver Broncos in the AFC Divisional Game by the same score, but lost to the New England Patriots in the AFC Championship Game 20-6. Following the season, Gilbride was hired by the San Diego Chargers to fill their head coach position vacated after Bobby Ross stepped down. 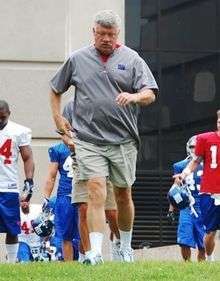 In 2004, Gilbride was reunited with Tom Coughlin in New York, where he became the Giants' quarterbacks coach. He worked with Eli Manning in that position for three years during which Manning led the Giants to a 6-10 record in his first season, but rebounded in 2005 to lead the team to an 11-5 record, capturing not only their first playoff berth since 2002, but their first division title since 2000. The Giants returned to the playoffs in 2006 but were ousted in the first round by the Philadelphia Eagles. Following that season, the Giants announced that the entire coaching staff would return on one-year contracts for the 2007 season. In the first round of the playoffs, they handily defeated the Atlanta Falcons 24–2 holding them to a safety in the first quarter. This was followed by a 37–20 divisional win against the Green Bay Packers, and set up another NFC Championship game appearance. The Giants faced the San Francisco 49ers in a game that ended 20–17 with Lawrence Tynes kicking a game-winner to send the Giants to the Super Bowl. Gilbride and his wife, Deborah, have three children: daughters Kelly and Kristen and son, Kevin M. Gilbride. Kelly is a 1998 graduate of Harvard University, Kristen graduated from the University of Connecticut in 1999, and the younger Kevin graduated from the University of Hawaii in 2003 and is currently the Giants' tight ends coach. ↑ "PRO FOOTBALL / DAILY REPORT : AROUND THE NFL : Oilers' Gilbride to Have Cancer Surgery". Los Angeles Times. December 10, 1992. ↑ "History: 1990s". titansonline.com. Archived from the original on November 19, 2008. Retrieved 2009-01-25. ↑ Lapointe, Joe (January 4, 1994). "PRO FOOTBALL; Is Game Still Football? Oilers Think It's Boxing". The New York Times. Retrieved May 7, 2010. ↑ Vacchiano, Ralph (December 30, 2008). "Teams lining up to interview Giants' Steve Spagnuolo & Kevin Gilbride". Daily News. New York. ↑ Wesseling, Chris (January 2, 2014). "Kevin Gilbride retires as New York Giants coordinator". National Football League. Retrieved January 4, 2014. ↑ "Kevin Gilbride NFL Record, Statistics, and Category Ranks". Pro-football-reference.com. Retrieved 2013-01-02.